Courier - 'Would never be viable' - really? A letter in today’s Herald urges the promotion of the new Edinburgh-Galashiels-Tweedbank railway rather than dwelling on where it doesn’t go. The Starlink campaign has expressed its disappointment that there is still no mention of a restored rail connection to St Andrews in the latest version of TayPlan, although new stations at Newburgh and Wormit are supported, subject to STAG (Scottish Transport Appraisal Guidance). 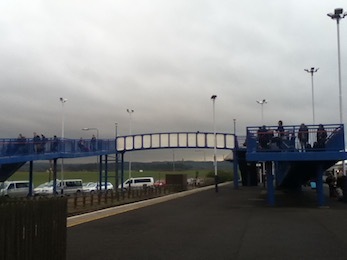 A packed train from London disgorged dozens of students today at Leuchars Station, providing an example of the potential for a railway going all the way to St Andrews. Instead, at least 60 students hauled their large rucksacks and wheeled suitcases for the next semester off the 10:03 from London King’s Cross and swarmed across the footbridge. While there was a longer than normal queue for the buses, these were clearly inadequate, being the normal service buses catering mainly for commuters and shoppers, and therefore having no provision for the amount of luggage being carried by the students. The bus pulled away, packed to the gunwales with luggage in the aisle, and leaving many students behind waiting for the next one. Many didn’t even try to board the bus but straightaway opted for taxis. As reported in the St Andrews Citizen the Starlink campaign is to hold discussions with the Alloa rail campaigners, who were successful in getting their branch line re-opened, with four times as many passengers as was predicted.